“The setting is an elegant library with carved rosewood–as if the Sistine Chapel and a library crossed. The focus, though, is on a painting hanging on the wall. It is of a woman, wearing a beautiful, full-length gown as if going to a ball, and she is holding a deep-red rose. She has long, black hair and green eyes. The portrait should have Diane sitting down, looking toward the spine of the book. Behind her, in the painting, a forest green (or some green that looks nice) tapestry with a unicorn (just enough to recognize it as such, if possible. 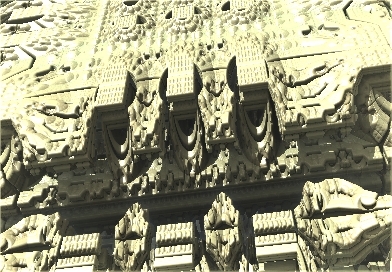 To create the library I started with the amazing free “3D Mandelbulb Ray Tracer”. It’s an amazing tool and it lets you create extraordinary images with a little patience. I made multiple renders and edited them together to create the basic structure and then went on to add lots of details. Patrice had a very specific vision for this cover. She gave me the stock shot of the Main Character and together we decided I would paint everything else (including the wings). Realism is always a challenge but I feel it was a great success, combining the best elements of both media. I’ve been working with Richard for quite some time and he usually gives me quite a free hand with what I do, but not this time. There is a lot going on and a lot of characters appearing in the image so how to go about bringing it to life in a way that will sell the book? Well, the image needs to draw the viewer into the scene so a view into the temple with perceptive to draw the viewer in and lighting to create a focal point seemed like a good start. First off I laid in a Golden Ratio 9 section Grid as a template which I would use to help balance the image. Next, the background/temple was laid in making sure there would be enough air for the title and Author in the top “third” of the grid. Now onto the characters. I decided to place these in layers from back to front in order to help enhance the depth. I sketched in the rough positions. Starting with the giant octopus creature in the background, making it dark and almost unseen. Next came Sorceress, I placed her to the right of the center section of the grid she’s kind of hovering in a dramatic almost Christlike pose, bathed in light, casting a spell. I placed a bright surge of magic power behind her that is reflected in the floor and this serves almost like vertical arrow drawing the eye up from the base right to her. Next, I painted the green smoke surging off to the sides which also serve to lead the eye in but this time from the sides. The next depth layer is the three skeletons were placed in the mid-distance, heads just below the centerline and slightly to the right of center. I painted then quite dark with stark highlights so they stand out well and at the same time look quite eerie. Now comes the second hero, dodging a blow from one of the skeletons. He’s much closer to the viewer and so much bigger in the frame. I placed him below the center and in the left section of the grid. He is painted in heavy contrast creating drama while standing out from the background. There is now also a good balance of tone and shape. The broken skeleton in the foreground again painted in high contrast adds another layer of depth while at the same time framing the base of the image. You’ll notice that by positioning and lighting the Sorceress and the Hero as I did I made them the “Stars” of the image. Now the rough was completed I sent it off for approval and fortunately, Richard liked it and so I went on to work it up to what you see here. The title, series name, and Author typography were all based on the existing Series name logo. Again it took a little thought but I was able to make it all tie together with the layout of the image. I left this until last but in hindsight, I think it’s always better to design the typography first since it can have a great impact on the final image. In this case, I was fortunate in that I had to make few changes to the overall painting, and of course, since I work digitally this is much easier to do. Had I painted this in oil I would have had a much harder time of it. “Weapons of Power” By David J. Normoyle. 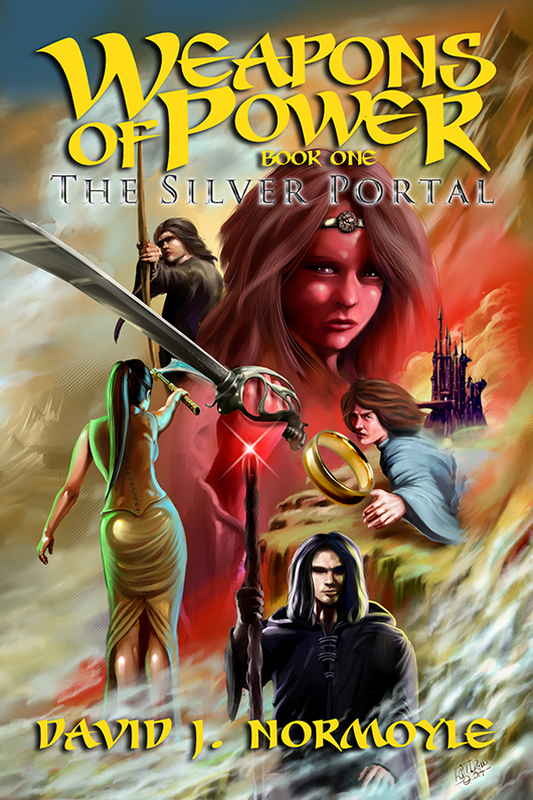 “Weapons of Power”, Book 1 “The Silver Portal” and Book 2 “The Black Bearer” By David J. Normoyle. This is the first and second part of an exciting young adult fantasy trilogy for which I am producing the covers. Obviously, when designing a series we have to think about how we are going to keep a consistent feel throughout all of the covers. They need to look like part of a series while at the same time looking exciting and new. Not as simple as it sounds. David gave me the synopsis of the books and after some discussion we decided to go for a kind of classic film poster format, featuring the main characters and locations that appear in the particular books. It’s also a good idea to hint at the kind of adventure the reader will experience when reading the books. The intention when designing covers like this is to create a kind of film trailer effect on the viewer, leaving them with a mind filled with excitement and questions they want to know the answers for. With that in mind, it’s essential to achieve a well-balanced layout, as well as a pleasing tonal and color balance, in order to draw the viewers eye in. David designed and provided me with the excellent“Weapons of Power” Logo for the series. It’s always important to ensure that the space allotted for title and Author is going to work well and be readable at all viewing sizes. Segregation of the cover using the rule of thirds or as I did for these covers, the more complex (but also more aesthetically pleasing) Golden ratios is always a good way to determine the best location for the Typography. Finally when it comes to the actual image (especially for this kind of genre) it can be useful to implement quite a lot of detail in order to keep the viewer engaged and another trick is to try to add glimpses in to landscape of the world in the fantasy that create the desire to enter the image and see more. Although these covers are paintings it’s quite possible to do this with a photo montage and not near as much skill is required. Thanks to http://skydancer-stock.deviantart.com/ for the great reference of Wizards. Suma – the woman with the Axe. “Walking Away From The King” by Mike Penney. Posted by keithdraws in Book cover, Composition, Fantasy art, golden ratio, Illustration. went as far as giving me a diagram showing me what elements would be involved. I’ll be honest, it was quite a scary brief. I’d never done anything like this before and converting a diagram into an interesting and hopefully captivating image seemed very daunting. So with that in mind I got stuck in. The composition was a challenge. I thought about those old Chinese landscape paintings guó huà and the way they are almost in layers from top to bottom achieving great depth (though with unusual perspective). I decided to try something similar but rather than create a weird perspective I simply changed the curvature of the earth so we can see much further. Using layers of content I built up the depth and of course, I continued to use golden ratios to help with the balance of shape, color, and contrast. As a cover designer, how would you have approached this? Geoff wanted to show an under ground and an overground world. Its best to hint at what’s there without giving away too much. – Amphibian-like with large eyes and a flattish nose. – They adorn themselves with living plants/moss/fungi/lichen that’s embedded into their actual skin. So you might have a female with a silvery lichen growing up the side of her face, or swirling patterns of tiny flowers receding over her brow. – No hair…they either have the adornments, or men wear flat cap-like hats. Females are taller than males and wear long headdresses to elongate their bodies. I decided the title would sit well in the middle and then used golden ratios to help me with the unusual composition, using the landscape to create a sense of mystery and a desire to explore.